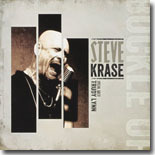 Winner of the 2004 and 2005 International Blues Challenge, Steve Krase and his band are all about high energy on his new CD, Buckle Up (Conner Ray). His hard blowing harmonica backs Trudy Lynn on her latest, Royal Oaks Blues Cafe, which is also on his Conner Ray label. The meat and potatoes, however, are on his own disc. This is a monster that does indeed call for a buckling up! 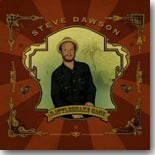 The opener, "Jolene," is an original rockin' rockabilly-tinged number. "... She pulled out a switchblade knife/I had to run for my life � the cops took her away/I just don't know what to say/Jolene/Now she's sittin in the county pen/I hope I never see her again �" This is underscored by burning guitar and a killer rhythm section. That's just the first number! Krase is a hard-blowing harp player. Coupled with his songwriting and impressive vocals, this is a combo that can't be beat. Guitarist James Henry is a name to watch for. David Krase is impressive on the three numbers he sits in for, too, but Henry is a bonafide hurricane. Speaking of big wind, the standout cut here is a cover of "Big Bad Woman." The energy threatens to burn up the sound system. "... She's so doggone evil/I'm about to lose my mind." Written by Big Walter Thunderbird Price from Houston, Krase and crew rock it hard. Price is also responsible for penning "Misery," another rocker. "... I tried so hard/to treat you right/all we do/is fuss and fight/please try to get along with me/cause I'm so sick and tired/livin' in misery �," and then off goes that amazing harp work. On his "Blueshound" he sings "... the Grim Reaper got nothin' on me/I was with the Dead back in 63/Jerry Garcia was a friend of mine/we'd drank some whiskey then we'd drink some wine ...there was a dead man laying on the side of the road/I'd kick him in his head just to watch him roll ..." Screamin' guitar courtesy of David Krase. On this collection of standout material, the version of "I Just Want to Make Love To You" features Ms. Trudy Lynn, and her title cut tells a tale in itself. "Buckle Up" warns "... I tried my best to please you/but you found somebody new/and now the tables have turned/you played with fire/you got burned/buckle up/this ride is gonna be rough ..."
Steve Krase is a confident, cocky, and cool cat. This is one of the year's best. All of the above are expertly utilized on these 11 impressive songs. From the opening notes on "Blind Thomas at the Crime Scene," Dawson displays his complete control of the instrument. His playing is bright and jaw-droppingly precise. "Flophouse Oratory" is played with more power, and the following "The Medicine Show Comes to Avalon" returns to beautifully played finger picking. As you might expect, this is reminiscent of Mississippi John Hurt. "Butterfly Stunt" is fleet fingered and "While The West Was Won the Earth Didn't Know It" has a deep and buttery feel to it. Fans of amazing guitar playing don't want to let this one pass. To my ears, the most impressive acoustic guitarist to come down the pike in years. Fans of Dan Crary will love this. Whew! 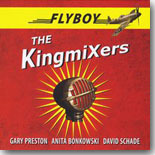 The Kingmixers are a basic three-piece Blues band hailing from the paradise known as Victoria, British Columbia, with their new self-released CD, Flyboy, being a nice disk of mostly original numbers. The band consists of Gary Preston (harmonica, keyboards), David Schade (guitar) and Anita Bonkowski (drums, bass, keyboards), with Preston and Schade sharing vocals. The disc kicks off with a hard-driving version of Robert Johnson's "Walking Blues," introduced with a harmonica solo from Preston. The band later shows its versatility of blues styles with an original, "The Quarter," which has a decidedly New Orleans funky beat and more strong harmonica work. Schade shows off some of his best guitar work on "Let Me Explain," an adaptation of a Sonny Boy Williamson blues shuffle, while Preston summons his best Rice Miller imitation on the harmonica. The final cover on the disc, Randy Newman's "Guilty," is a jazzy, late night number with tasteful guitar from Schade. One of my favorite numbers here is the Bonkowski-penned instrumental "Gizbone," kind of a jazzy shuffle with keyboards, guitar and harmonica each trading off on the leads. It's a nice showcase for each of the individual band members. Another instrumental, "Passaic Walk," is a slow number that brings to mind the classic "Harlem Nocturne," with Schade's restrained yet mesmerizing guitar chords shining here. While not a great singer, Preston gets a lot of emotion out of his voice on the mid-tempo shuffle "You'll Never Get The Blues," while he also kicks out one of his better harmonica solos. Flyboy is a fun album from this solid three-piece Canadian band, and certainly worth checking out on the CD Baby site. 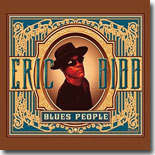 The title of Eric Bibb�s latest release on Stony Plain Records has a two-fold meaning. Blues People is taken from the title of LeRoi Jones� classic book, which was the author�s attempt, as he put it, to look at �(t)he path the slave took to citizenship.� Bibb goes down that path with this release, and continues the journey, focusing on the history of African American (the original �blues people�). The title also pays tribute to blues musicians past and present, with numerous current �blues people� making contributions to the album�s 15 tracks. The guests include Popa Chubby, who plays guitars on the opener, �Silver Spoon,� Guy Davis, who plays guitar and contributes vocals to his own �Chocolate Man,� J.J. Milteau and the Blind Boys of Alabama, who add harmonica and backing vocals, respectively to �I Heard The Angels Singing.� The Blind Boys return for the gentle �Needed Time,� along with Taj Mahal, who plays banjo and adds vocals with Ruthie Foster. Harrison Kennedy and Foster contribute vocals to �Dream Catchers� (about the Selma marchers), Linda Tillery on �Remember The Ones,� and Andre De Lange on the uplifting �Home.� Leyla McCalla adds banjo and vocals on �Where Do We Go.� Producer Glen Scott is featured on vocals on one track, �Chain Reaction,� but is present on all the other tracks as an instrumentalist and his production is peerless. Bibb�s blues are gentle and elegant, often spiritual and upbeat. The centerpiece of the album is �Rosewood,� a narrative about the small town in Florida that was the site of a horrible racially driven massacre in the early 1920s, but even through the narrative of this song and others on the album, the message of optimism and hope still resonates. An album from Eric Bibb is always a pleasure to hear. The music is lovely and the message is always profound. Blues People is no exception to that rule, and ranks with Bibb�s best work. 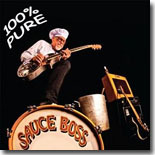 The Sauce Boss (Bill Wharton) gained a big following in the late �80s/early �90s, with his dynamic live shows and the gumbo he cooks during his show (and serves afterward). He�s known for his song, �Let The Big Dog Eat,� which was featured on the movie Something Wild, and has been featured in Jimmy Buffett�s song, �I Will Play For Gumbo.� For his latest release, 100% Pure (Burning Disk), Wharton takes the one-man-band approach, singing, playing drums, and laying down some of the nastiest slide guitar you�ll hear on a dozen self-penned tracks. The emphasis is definitely on the blues, with tracks like the rowdy opener, �Zipper Bird,� the aptly-titled �Marquis De Swamp,� the visceral �Chains,� and the humorous �Delta 9 Blues,� an ode to a certain temporary herbal approach to escaping your trials and tribulations. There�s also �Chicago Combat Zone,� a topical tune about the current dangers in the Windy City, and the blues/rock closer, �Outlaw Blues,� which is powered by crunching guitar riffs and swampy slide. The lighthearted �Gonna Be All Right� is a nice change of pace, with its Latin rhythms and message of encouragement, and �Sun� continues that trend a few tracks later. �Peckerwood� comes in from the country side of things with an upbeat, top-tapping rhythm, and the ballad �Cadillac of a Woman� follows suit, with some really nice guitar work from Wharton. �Song of the Irish Band� is a somber reflective ballad on how songs are created, and �Hey Wilbur� is just fun and games. I really like Wharton�s one-man-band approach on 100% Pure. This disc just grooves from beginning to end, and is a lot of fun to listen to. The Sauce Boss knows how to throw a party and the only thing missing is the gumbo after Track 12 comes to a close (not to worry�.you can make your own version of the Sauce Boss�s gumbo, thanks to the recipe on his website). Enjoy! Tenor saxman Bobby �Hurricane� Spencer has been a mainstay of the Bay Area music scene for years, playing all the clubs and backing artists such as Sonny Rhodes, Little Johnny Taylor, Rodger Collins, Koko Taylor, Jimmy McCracklin, J.J. �Bad Boy� Jones, and the Timex Social Club in the studio. In the clubs, he backed legends like Etta James, the Whispers, Lowell Fulson, Z.Z. Hill. 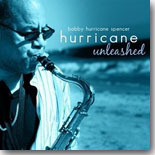 Hurricane Unleashed (R. Music, Inc.) is his second solo release, and not only features Spencer�s force-of-nature saxophone, but also shows him to be a powerful vocalist and songwriter. Spencer touches on blues, jazz, and funk on the opener, �Gotta Get Back To Chicago,� with some tasty rhythm guitar from producer Andrea Balestra, moves toward R&B with the mellow �You�re All I Need,� and works into some zesty swing with �Camarillo.� A reworking of the classic instrumental �Honky Tonk� teams Spencer with guitarist Lester Lands. �Lovers Hill� is another soulful R&B track, and �Little Mama� ventures into funk territory with some sassy sax blowing from Spencer. In addition to Balestra, Lands, and Meeks, Spencer gets great support from Matias Alvear Fall (bass), Dario Benzoni (drums), Albert Trepagnier, Jr. (congas), Tyler Combs (vibes), Josh Agular (trumpet), Wesley Smith (alto sax), and backing vocals from Kelly Chappue, Basa Mora, and Dominique Toney. Hurricane Unleashed is a nice change of pace from the standard guitar-focused blues fare of recent years. Bobby �Hurricane� Spencer has more than enough chops to carry an entire disc with his tenor sax, but he makes things even better with his smooth and soulful vocals and savvy songwriting. The No Refund Band (Ricky Jackson � lead vocals/lead guitar, Rik Robertson � bass, Mike Crownover � rhythm/lead guitar, Anthony Terry � sax, and Jim Brady � trumpet) have worked together since 2007, but waited five years before releasing their self-titled debut CD in 2012, which effectively mixed slick urban blues with gritty blues rock. 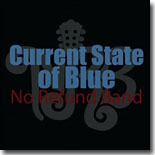 Two years later, the band returns with their follow-up, Current State of Blue. This time around, the band increases the number of original tunes from six to nine and they cover the bases pretty well, showing an ability to cover several different styles of blues lyrically and musically. The opening track, �Buy the Blues,� is a sinewy blues track that would have been a good fit on an Albert King album. The title track follows, mixing the blues with a touch of jazzy swing, thanks to the punchy horns and piano from guest Randy Wall. The horns are also prominent on the upbeat �St. Louis Bound,� and the jazz vibe continues on the soulful �Favorite Fool.� �Love Unmade� mixes R&B with funky Latin rhythms, and the shuffle �I Gotta Play� swings nicely. �Blues Man Dying,� an amusing look at the trials of being a musician is also a standout. NRB also includes three well-done covers on this release. Their version of Eric Clapton�s �Bell Bottom Blues� measures up well to the original, and a frenetic take on Mountain�s �Mississippi Queen� is also successful, but the best of the covers is the late Gary Moore�s �Still Got The Blues.� Jackson really outdoes himself on vocals and guitar on this track. Guest musicians include Wall (piano), Travis Doyle (Hammond B3), Kelly Dean (alto sax), Paul English (trumpet, piano, and synthesizer) and Warren Sneed (tenor sax). Percussion is split between four drummers (Tyson Sheth, Joey Riggins, Walter Cross, and Mike Burch). There�s plenty of great blues on Current State of Blue, but what makes this album stand out from the pack is the band�s subtle mix of soul and funk and Jackson�s muscular vocals and guitar work. I don�t believe anyone listening will be asking for their money back on this fine effort from the No Refund Band. 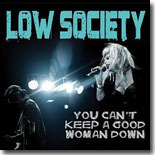 Low Society was born when guitarist/NYC resident Sturgis Nikides met singer/Houston native Mandy Lemons. Nikides has played with Velvet Underground co-founder John Cale and led the band Voidville and is highly touted for his slide guitar skills. Lemons� vocals are influenced by an impressive group, including Bessie Smith, Koko Taylor, Etta James, and Janis Joplin. The pair ended up relocating to Memphis three years ago, where they have continued to produce their exciting mix of blues, rock, and soul. Joined by a rock solid rhythm section (Mike Munn � drums, Nick Dodson � bass) their second release, You Can�t Keep A Good Woman Down, is their debut for Memphis� Icehouse Records, and features 12 tracks of pulverizing, mesmerizing Texas-styled blues, rock, Americana, Memphis soul, and tons of attitude. The band plays off of Lemons� amazing vocals perfectly. Nikides� masterful guitar work, especially his slide guitar, is always in the right place at the right time, and as valuable to the group�s DNA as Lemon�s singing. The rhythm section is spot-on as well, and the band gets invaluable support on several tracks from Brian Hawkins on harmonica, Lee Booth on backing vocals, former B.B. King Band member Dr. Herman Green and Rick Steff, whose contributions on keyboards and accordion help lift a great album to even greater heights. Expertly produced by Nikides, and recorded at the Memphis landmark American Recording Studio (mastered by Stax Records stalwart Larry Nix), you�ll be hard pressed to find a better mix of blues, rock, soul, and attitude�..all with an decidedly southern twist�..than Low Society�s You Can�t Keep A Good Woman Down. Bill Phillippe is a San Francisco-based blues guitarist, who has spent the past 20 years performing around the Bay Area in various venues. His latest release, Ghosts (Arkansas Street Records) is a stirring mix of original songs and 1920s and �30s acoustic blues with a focus on the Mississippi Delta. Produced by Phillippe, the disc really captures the atmosphere of that musical era with its production values as well as his guitar work and vocals. Ghosts has 13 tracks, with Phillippe covering songs made familiar by Robert Johnson (�Come On In My Kitchen�) and Son House (�Death Letter�), along with a strong set of spiritual classics (�Keep Your Lamp Trimmed and Burning,� �Motherless Children,� �God Don�t Never Change,� �In My Time of Dying,� and �You�re Gonna Need Somebody On Your Bond�). Phillippe actually puts his own spin on these tunes while maintaining the intensity and energy of the original versions. Ghosts will surely please fans of pre-war, acoustic blues guitar. 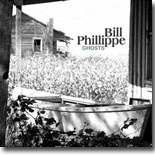 Bill Phillippe�s guitar work is extraordinary and he brings passion and fire to his interpretations of classic songs of the past as well as his own powerful original compositions. Donald Ray Johnson started playing the drums at the age of seven in his native Bryan, Texas, and was soon backing local blues artists as a teenager. After a stint in the Navy, he ended up in California in the �70s, backing artists like Joe Houston, Lowell Fulson, Phillip Walker, Percy Mayfield, Sonny Rhodes, Maurice John Vaughn, and Big Mama Thornton. In the late �70s, he joined the band A Taste of Honey, who enjoyed success on the Pop and R&B charts with songs like �Boogie Oogie Oogie� and �Sukiyaki,� and won the 1979 Grammy for Best New Artist. Since 1989, Johnson has lived in Canada, where he�s become a respected member of the Canadian blues community and has released six albums of his own material. Vocally, he�s has a lot of Al Green in his delivery on some songs, but with a gruff downhome flavor, too, which helps him on the more traditional blues fare as well. 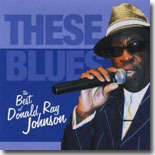 Recently, Johnson released These Blues � The Best of Donald Ray Johnson (Mar Vista Records), which features 13 of the highlights from his previous releases. The 13 tracks include nine originals written by Johnson, plus four diverse cover tunes. Johnson�s own tunes include the funky Jimmy Reed-styled �Gone So Long,� the sizzling urban blues title track, the swinging �Slow Down Baby,� the smooth and soulful �Here To Stay,� �Me and Jack (Daniels),� which includes steel guitar from Sonny Rhodes, and �No Guitar Blues,� a nice slow blues. �Thrilling You Killing Me� is another slow blues with a strong vocal from Johnson and some stinging lead guitar. The cover tunes are Al Green�s �Ain�t No Fun To Me,� George Jackson�s �Last Two Dollars,� Hazel Dickens� �Working Girl Blues� (associated with Phillip Walker), and a surprising acoustic reworking of �Always On My Mind,� that features a warm, heartfelt vocal from Johnson, who really shows his versatility on this track. These Blues serves as a wonderful introduction to Donald Ray Johnson, an underrated artist who is certainly deserving of more attention. 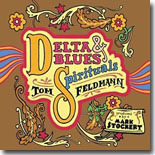 Delta Blues & Spirituals (Magnolia Recording Company) is Tom Feldmann�s 12th release. The Minnesota-born guitarist/singer is a highly regarded performer and instructor (featured on 13 instructional videos), focusing on bottleneck slide and prewar Mississippi Delta blues. As on his previous efforts, and as indicated by the title, Feldmann mixes traditional blues with gospel, but this release took a while to see the light of day. Work on the album actually started in the summer of 2013, but a fire broke out in the studio, nearly destroying it in the process. Feldmann waited a year until the studio was rebuilt to resume work. The results indicate that the wait was well worth it. Feldmann�s guitar work is incredible, as always. While he sticks fairly close to the originals, he throws a few curves into his playing. I�ve always been puzzled by guitarists who think that these musicians played a song the same way every time and insist on recreating a song note-for-note. Musicians back in the �20s and �30s obviously performed for different audiences and more than likely changed songs around to fit with each group of listeners. I really like Feldmann�s vocals as well. He has a warm, accessible style that suits these songs well without trying to imitate the original versions. I always look forward to hearing a new Tom Feldmann CD because of the fantastic guitar work, and his tireless efforts to present the early blues artists and their music. I was not disappointed with this latest effort. Delta Blues & Spirituals is a disc that will satisfy fans of pre-war blues and fans of guitar. Feldmann doesn�t tour due to family reasons, so the best way to catch his music is by picking up one of his CDs or DVDs. This is an excellent starting point. 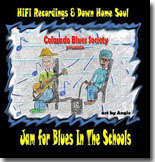 The Colorado Blues Society sponsors a Blues in the Schools program in area schools, with the objective of educating students about the history of the blues and blues-related music through information and interactive performances. To help fund CBS� efforts this year, harmonica player Dan Treanor assembled some of the Centennial State�s finest blues musicians and recorded Jam for Blues in the Schools, with proceeds (100%) from album sales going to help fund the program. The group, which includes Treanor (harmonica, guitar, Khalam), Erica Brown (vocals), Randall Dubis (vocals, guitar, lap steel), John Weeks (guitar), Scott Hackler (keyboards), Tim Mahoney (guitar), Scott Headley (drums), Mike Wysocki (bass), Doug Egan (keys), Anton Stuart Medas (bass), Bruce Collins (drums), Alan Simmons (sax), Tony Arceneaux (sax), Michael Hossler (guitar), Gary Flori (drums), and David Booker (guitar, vocals) present an eight-song set consisting of three solid originals and five covers. The album was recorded live in the studio, in one take�..no overdubs. One thing about albums like this, featuring players who are used to working together regularly, is that the musicianship is always excellent. These artists have built a rapport over time and it shows. Brown handles most of the vocals with aplomb, but Dubis and Booker acquit themselves quite well on their tracks. This CD is definitely worth a listen, and will be available for $10 (plus shipping) at any Colorado Blues Society-sponsored events, or by contacting CBS at (303) 694-2000, visiting their website, or email at sfitzke@sfhlaw.net. As previously mentioned, 100% of the net proceeds will go to fund CBS� blues education program. We�re talking good music (over 60 minutes worth) for a good cause, so you should check it out. I remember Erin Harpe & the Delta Swingers from their first appearance at the International Blues Challenge a few years ago. Erin also competed on the acoustic side with her harmonica genius, Richard �Rosy� Rosenblatt, and I have to admit I was intrigued when their new disc, Love Whip Blues, came in the mail. The band labels their style �Charles River Delta Blues� and that�s an interesting description of what they do for sure. I�ve just appreciated their lighter touch to the Blues after listening to their new disc so let�s give it a spin. A heavy backbeat from drummer Bob Nisi sets the tone as Erin implores us to do �The Delta Swing.� �Swing me, baby�like a dancing queen�swing me, baby�like you�re dancing queen�the way you swing me baby�the best I�ve ever seen.� We�re not sure exactly who Erin�s dance partner is but he�s doing a good job and you can hear the happiness in her voice. The title cut, �Love Whip Blues�, is next and Rosy�s harp begins to make an appearance in the mix. Erin�s telling us �I wanna be your love whip�just me�a little booty machine�what you saw fine and easy�I�m going to make you scream.� I honestly don�t know what to say about this but I am sure Erin�s more than up to the task of cracking �the love whip.� Our tempo picks up a bit and the band tackles Willie Brown�s �Future Blues.� �I can�t tell my future�sure can tell my past...well it seems like any minute�you�re going to be my last.� David Gross is lending his fretwork to the mix and I appreciate the subtlety of Rosy�s harp playing behind Erin�s vocals. Bob Margolin make an appearance and lends his slide guitar to the band�s take on a Lucille Bogan tune, �M & O Blues,� and here the train is taking Erin�s man away from her. �When he was leaving�. the night he left�I heard that whistle blow�and the man I desired�he ain�t coming back no more.� Erin�s fortunes seem to have changed and she tells of her newfound happiness in �One Way Man.� �Can you spare me a nickel�or a lousy dime�so I can feed that hungry man of mine.� He�s treating Erin right and she�s more than happy to take good care of him as well. Our next tune, �Pick Poor Robin Clean,� fits stylistically into the mix of Love Whip Blues, but I�m not sure how I feel about a tune a dead man�s carcass clean but it seems Erin is glad he�s out of the family. I�m guessing �Virtual Booty Machine� is a part of the Charles River influence on the band�s Delta Blues. �Virtual�virtual�booty machine�yeah�yeah�yeah�. take your booty and shake your booty and�make a date with the booty machine�. oh yeah.� Not quite sure what a date with the booty machine gets you and proper decorum would suggest I don�t speculate too far into this tune. Erin�s guitar provides us the intro to our next tune, �Charles River Delta Blues.� �I�m going down to the Delta�where I can drink and have my fun�where I can drink my white lightning and gamble�and bring my baby home.� Erin�s version of the Delta sounds like the kind of good time we�re looking for and a little white lightning goes a long way. Erin & the Delta Swingers close out Love Whip Blues with an upbeat and interesting take on John Prine�s �Angel From Montgomery." Totally in the vein of their �Charles River Delta style� and a refreshing take on a classic song from John Prine. 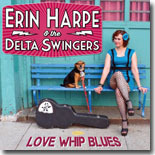 I�m surprised that Love Whip Blues is the debut release from Erin Harpe & the Delta Swingers, but they�ve definitely had a great time sharing their brand of blues with us. I�m looking forward to hopefully catching a set from them at this year�s IBC and see for myself the evolution of this great band from Bean Town. It will be an interesting experience for sure. Though it�s been awhile since I�ve raised a glass of tequila with Sugar Ray and Anthony, courtesy of Barb Wandrey�s thoughtfulness, Sugar Ray and the Bluetones have remained one of my favorite bands to work with over the years. Together for nigh on 40 years now, their new disc, Living Tear to Tear, has hit the world by storm and it's time to give it a listen. Sugar Ray�s harp kicks the party off as the band tackles the first cut on their disc, �Rat Trap.� The girl thought she had the trap set perfectly, but as Sugar Ray notes, �it�s the second rat that gets away with the cheese.� A perfect start to the disc, and I�m hearing Monster Mike Welch�s guitar tearing it up and Anthony Geraci�s keyboard work complements the back end of drummer Neil Gouvin and bass player Michael Mudcat Ward to perfection. The Bluetones are indeed one of the tightest bands around. Up next is �Here We Go� and this tune starts out with a big band sound. �Here we go�trying the same thing one more time�here we go�we�re trying the same thing one more time�if you think that thing will change�you must be out of your mind.� Sugar Ray and his woman have a difference of opinion on how their relationship is working out and he�s apt to leave her behind if she won�t listen to what he has to say. He�ll meet her halfway but that�s as far as he goes. Hopefully she will work as hard as it as Sugar�s willing to. And, of course, �Things Could Be Worse,� the title of our next tune. �You should quit you�re complaining�and be thankful first�because for every bad�I know there�s a worse.� Sound advice from Sugar Ray, things aren�t always as bad as they seem, they could be worse. Anthony�s piano kicks off �Living Tear to Tear� and Sugar Ray chimes in with a shrill harp burst before telling us that he�s not happy with the current state of affairs. �Living�I�m living from tear to tear�. well, living without you, baby�. means I�m living tear to tear.� He calls for a solo from Mike and I�m reminded once again why he�s one of the premier guitar players in the world today. The first ballad on the disc, �Misery,� is up next and Sugar Ray is definitely in pain. �Misery�tears fall down my face like rain�oh last night my baby left me�Lord, I�m throwing up to get drunk again.� Sugar Ray�s pain is real and the bartender gladly pours him �another glass of wine�well I�m going to sit here�and keep on drinking�'til I drink my baby off my mind.� He�ll hurt worse in the morning but Sugar Ray isn�t thinking about that though he�s well aware the bartender will have to cut him off eventually. Sugar Ray and the band have traveled all over the world, sharing their Blues with everyone and he tells us about it in �It�s Never as Bad as It Looks.� �I played California�then Ontario�down to New Orleans�I say it�s never as bad as it looks, people�never as bad it seems.� A healthy attitude for life on the road and this band can regale you with hours of tales from their time spent touring. I can vouch for that. The band takes time out for an instrumental, �Short Ribs,� and everyone is given a chance to stretch their legs a bit and do what they do best, play the Blues. Anthony�s piano is at the forefront as Sugar Ray tackles another ballad, �I Dreamed Last Night.� �I dreamed last night�you were walking through my door�. but when I open up my eyes�baby, you weren�t there anymore.� I�m sure she was a good woman but now�s she�s gone, and her memory haunts Sugar Ray in his dreams. Time heals all wounds, but Sugar Ray is left with his memories for now. �Ninety Nine� restores a happy vibe as Sugar Ray tells us a story from his past. �You asked me for a hundred dollars�I didn�t have but ninety-nine.� Not sure who needed the hundred dollars, sounds like a woman in Sugar Ray�s life, but I appreciate the return to a more upbeat tune from this amazing band. �Our Story� is Sugar Ray�s version of a love story as he pays his respects to the one that he loves. �When we first met�I didn�t know�you�d be the only one for me�for five long years you waited, Darling�yes, you did�it took me that long to see.� I�m kind of surprised that Sugar wasn�t quicker on the draw but it sounds like it all worked out in the end and I�m happy for him. His harp work on this tune is classic and he remains one of my favorite harmonica players on the planet. Sometimes the way to a man�s heart is through his stomach and sometimes it isn�t. Sugar Ray tells us all about it in �Hungry But Happy.� Mike�s guitar and Anthony�s piano provide the intro for this tune and here we find that Sugar Ray is satisfied. �My baby serves my dinner cold�but she sure is one hot little girl�. oh, I don�t mind when I go hungry�I�m the happiest, hungry man in this world.� She�s obviously not good in the kitchen but Sugar Ray is happy with her talents elsewhere and that�s all that really matters in the end. The band closes with �Nothing But the Devil� and Sugar Ray is singing to us through his harp mic. �Nothing but the devil�make you treat me the way you do�I�m going to break out�just like the measles�little girl, I�ll get all over you.� Sugar Ray�s woman is stepping out and treating him mean, it�s time for her to go. 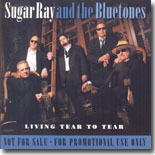 Living Tear to Tear is a rock solid record from top to bottom for Sugar Ray and the Bluetones and the proof is in the pudding. It�s garnered seven Blues Music Award nominations from the Blues Foundation and I for one, am looking forward to sharing another glass of tequila with my friends Anthony and Sugar Ray. Sugar�s website is www.sugarrayandthebluetones.com. Catch this band live when you can, they�re one of the hardest working groups in our genre today. I first met Lauren Mitchell a year ago at one of her IBC send-offs at Aces, in Bradenton. I liked her sound and bought a disc to help support the effort to send her to Memphis. It was a good disc, but I�ve heard a million records in my time and no offense to Lauren, it just didn�t stick with me. But I�d heard good things about her newest release, Live at the Bradfordville Blues Club, and had the opportunity to ask her about it when I was in Florida in December. It�s my good fortune that she had a disc on her when we met and it�s in the CD player now. Let�s give it a listen. My friend, Gary Anton, owns the Bradfordville Blues Club (the BBC) and it�s still on my bucket list to venture there for the BBC experience. Lauren�s disc opens with an intro from a DJ at 106.3, the Path, and then the band hits it off in high gear. Guitarist Bob Fieberts kicks off the first tune by Earl Thomas & Phillip Wooten, �I Sing the Blues,� and the Professor, Michael Hensley, is working his magic on the B3. And then Lauren prowls onto the stage and I�m wondering, where did this wild woman come from? �If you want me bad enough, its catch as catch can, when I want it hot enough�with my man�and I sing the blues.� I love Lauren�s attitude and there�s no doubt she owns the crowd at the BBC. The tempo slows down just a tad and the band tackles an original tune, �It�s Raining.� �It�s raining in my heart�so tears will start�raining�raining�ever since we�ve been apart.� Lauren�s definitely sad at the loss of her man, you can hear the pain in her voice and she�s truly hopeful that her man will come back around. Bob lends an emotional riff to the mix and I�m a fan of this original tune from Lauren and Michael. Next up is a rousing addition of a Koko Taylor classic, �Voodoo Woman.� Lauren takes a minute to introduce the band and then they�re off. �They call me the voodoo woman�and I know the reason why�when I raise up my hands�don�t you know the sky began to cry�down.� The growl in Lauren�s voice is giving Koko a run for her money and the tune is well received by the crowd at the BBC. Next up is a tune for the ladies, another Lauren Mitchell original, �Sugar Mama.� Lauren�s having man troubles and she�s trying to get her point across to where he listens to her. �Don�t want to do your dirty laundry�or mop your kitchen floor�not gonna wash your dishes�run your errands anymore�I�m tired of cleaning up your mess�I�d rather live alone�so take your empty beer cans�and walk on out the door�I�m not your sugar mama anymore.� I�m pretty sure that he got the message, given the way Lauren put it to him. And I�m pretty sure he lost a good thing in the process. Every now and then the universe comes together for a magical night and Lauren�s gig at the Bradfordville Blues Club was one of those. Her band: Bob Fieberts on the guitar, Michael Hensley on the B3; Mike Snyder on the bass; Charles Steptoe on the drums and a guest appearance by Dr. Bill Landing on the saxophone all combine to provide a stellar backdrop to the moans, growls and aggressive vocals of Lauren Mitchell. I�ve enjoyed this live disc of Lauren�s immensely and the only advice I could give is to please include more original tunes next time. Definitely a good party record to have, The Lauren Mitchell Band � Live at the Bradfordville Blues Club, will finds its way back into my CD player soon. Jasmin Lee, daughter of blues-rock legend Alvin Lee, is honoring her late father�s memory by making him the first musician to feature on the innovative, subscription-based Digital White Label with Live At The Academy of Music, New York 1975. At regular intervals, over a 12-month period, a previously unreleased collection of tracks is downloaded, alongside a variety of other exclusive material accessible on-line, all for the price of a single CD. The first two cuts from this album were reviewed in Blues Bytes in July 2014, with the entire album now available. Alvin had taken his first steps away from Ten Years After with his recording of On The Road To Freedom with Mylon le Fevre. He then decided to take his solo material live with a one-off show at the Rainbow Theatre, a sell-out event which included Beatles Paul, George, Ringo and Rod Stewart. In Flight was the live album from the Rainbow Theatre and subsequently the show went on tour with Alvin Lee and Co with a different band. The songs released from this live gig in New York are nearly all from the In Flight double album of 1974 but they are very different in this new format. This is because these are extended, live performances from what was clearly a memorable night in New York, and the fact that the bass and keyboard players for this 1974-75 world tour were the sensational Steve Thompson and Ronnie Leahy respectively. Neither artist featured on In Flight but who can forget Steve�s thumping, mesmeric riff on John Mayall�s classic blues/jazz number, "California?" Leahy, of course, found fame with Stone The Crows and Jack Bruce. The band also includes iconic former King Crimson members Mel Collins on flute and saxophone and the late Ian Wallace behind the drums. Thompson and Wallace are in perfect rhythmic synergy on all tracks whilst Leahy�s exquisite keyboard skills are evident throughout. Not surprisingly, Alvin�s powerful vocals and trademark blistering and incisive guitar solos steal the show. 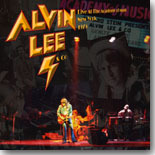 However, standing out front, Alvin Lee also taps his foot gently and takes time finding the right notes, his fluid, versatile and inventive playing highlighting the difference musically between this band and Ten Years After. New versions of songs like "Let�s Get Back" and "Time And Space" give a real sense that all of the players are going back to their roots, with Collins� atmospheric flute playing and changes of tempo on his saxophone solo a tour de force on the latter. The mellifluous "All Life�s Trials" with its sumptuous flute accompaniment confirms Alvin�s status as a consummate wordsmith. Lee is clearly at home when playing the music passed on to him by his blues-loving dad, none more so than "Every Blues You�ve Ever Heard." In the soulful ballad, "Going Through The Door," Alvin sings with anguish that he is �Gonna be free, yes I'm gonna be free, I don't care to be a fantasy.� The full-on aural assault of "I�m Writing You A Letter" is raw energy from start to finish, Alvin and Ronnie stretching their chops and dueling like Wild West gunslingers. The show ends with one of hell of a rollercoaster journey, "Ride My Train" with its mesmeric rhythm, screeching vocals, crunching chords, bent notes and sinuous solos. How the roof of the Academy Of Music did not come crashing down at this moment remains a mystery 40 years after! Thanks to expert mastering, mixing and executive production, the original tapes are transformed into a crystal clear, high quality recording which is far superior to most live albums from that period. Given the outpourings of grief and universal respect for the legendary musician who passed away far too early at the peak of his creativity, this commemorative package is an important legacy.